Doug Bowie fell into a writing career when he entered a CBC TV contest on a whim while working as a copywriter for an Ottawa ad agency. His teleplay Who Was the Lone Ranger? won a top prize, went on to be produced, and launched a 40-year career. "Looking at it later, I realized it wasn't all that good," says Bowie. "It was the first thing I'd ever written, and I'd pretty much thrown it together in my spare time. But it had a catchy title and a trick ending which probably caught the judges' eye. For better or worse, it saved me from a lucrative career in advertising or possibly corporate law. While it was great to win, it was also something of a snare and a delusion, because it made me think writing was easy. I promptly dashed off a couple more scripts, which were just as promptly rejected." Bowie persevered, however, and eventually sold a second script to the CBC -- Amnesty, an offbeat comedy-drama about two old men living amidst a mountain of long overdue library books. It was later produced on stage as well by the Smile Company in Toronto. After leaving the ad agency, and a sojourn in law school, Doug eventually became a full-time writer. Numerous half hour and hour dramas for the CBC and NFB followed, including, The War Is Over, Breakdown, Gunplay, The Krokonol Hustlers, The Contest Eaters, You and Me, A Gun, a Grand, a Girl -- as well as a couple of radio dramas, including an adaptation for CBC of one of his favourite books, "That Summer in Paris", and the feature film U-Turn, starring David Selby. Following these, Doug found his stride with a succession of well-received and wide-ranging film and television dramas, including The Man Who Wanted To Be Happy, The Newcomers (starring Bruno Gerussi and Martha Henry), The Boy in Blue (starring Nicolas Cage), Obsessed, the epic mini-series Chasing Rainbows (starring Paul Gross and Michael Riley) which critic Gerald Pratley called "wonderfully dramatic and romantic ... a triumph for Bowie". Doug also wrote the Gemini Award winning Love and Larceny, starring Jennifer Dale, and its sequel Grand Larceny, for which he won the Columbus International Screenwriting Award. Almost all original scripts, many of these are period pieces which interweave real and fictional characters against historical backgrounds. In this vein, Doug's most acclaimed work is probably the CBC mini-series Empire, Inc., the multi-generational saga of Montreal tycoon James Munroe. 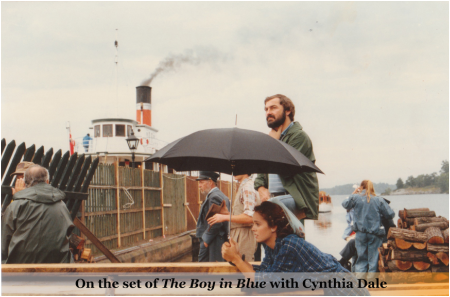 Called "quite possibly the network's best drama ever" by Canadian Press, it won critical accolades and several ACTRA Awards, including best writer for Bowie and, according to the reference book The Film Companion, "set new standards for Canadian drama on television." It has subsequently been seen in some 75 countries, and was recently included on the Ottawa Citizen's list of the best TV dramas of the past 50 years. Bowie also authored Must Be Santa for the CBC and Universal, starring Dabney Coleman, which has become a Christmas perennial, and was called "dazzling ... one of the best new holiday films in years" by TV Guide. 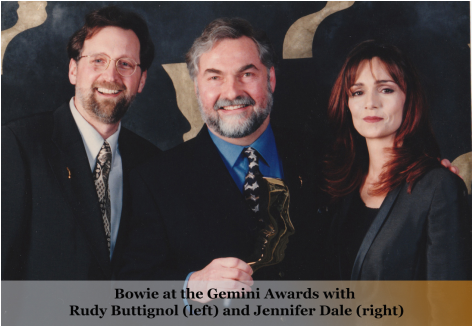 Bowie edited the book "Best Canadian Screenplays" with Tom Shoebridge, and was honored at the 1998 Geminis with the prestigious Margaret Collier Award for an outstanding body of work by a writer in television. He has also taught occasional writing workshops, and worked as a dramaturge in theatre and story editor in film & TV. In mid-career, Bowie began writing plays (The Noble Pursuit, !SGODSDOGS! ), and now divides his time between playwriting and screenwriting. While many of his TV scripts have been set in the past, most of his plays are contemporary comedy dramas. 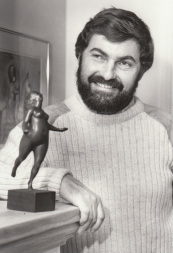 Doug was the Playwright-in-Residence for many years at the Thousand Islands Playhouse in Gananoque, one of the most successful summer theatres in Canada. His play Goodbye, Piccadilly premiered at the Playhouse and has gone on to several more productions, including the Blyth Festival, Theatre Aquarius in Hamilton and The Red Barn Theatre, Jackson's Point. It was termed "wonderful" and "particularly delicious" by Toronto's Classical 96.3 FM. Working with composer David Archibald, Doug created Love and Larceny, an "almost true" musical based on his Gemini-Award-winning movie about flamboyant Canadian con-artist Betsy Bigley. It opened at the Thousand Islands Playhouse in 2004 and was called a "singing, dancing delight -- a toe-tapping jewel of a musical." 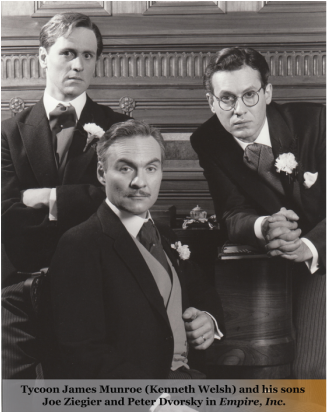 It was followed by Rope's End, a bittersweet comedy/drama about the choices we make in life. It premiered during the Thousand Islands Playhouse's 25th anniversary season to great critical and popular success, and has gone on to further productions at the Manitoba Theatre Centre, Theatre Orangeville, the Blyth Festival and elsewhere. Next came Till it Hurts, perhaps the first comedy written on the subject of philanthropy and undoubtedly the first to feature Beethoven, Stephen Lewis and Bono. Bowie's newest play is Somewhere Beyond the Sea, which premiered in 2012 at the Thousand Islands Playhouse. Doug lives in Kingston, ON. and has served on the boards of Theatre Kingston, Cinema Kingston and Hope Theatre. He was also president of the Kingston Tennis Club for several years. When he isn't working on the a new play or script he can often be found on the courts, working on his backhand.